As Hollywood-style blockbusters go, United We Stand: Europe has a Mission seems to have it all: superstar hotties Ewan MacGregor and Penelope Cruz, international intrigue, gripping action. But what it doesn't have is American heroes. Or a budget. Or a distributor. Or... film. 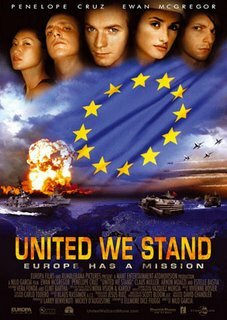 United We Stand is a fake, a send-up of America-saves-the-world action films by Italian-born hacktivists Eva and Franco Mattes (aka 0100101110101101.org). Now on view at Postmasters Gallery, the non-existent (but "fully EU-produced") film is set in the year 2020, when the US is on the verge of war with China and only a team of European agents can prevent global disaster. In the movie posters, as Artnet writes, "The clash of codes is almost palpable. The jingoistic conventions of American action movies are thrown into relief against expectations about the more arty content of European movies, and vice versa." It would be a great film i think.